Seriously, it seems like every week I'm reviewing an RPG for the Playstation 3. Not that I'm complaining mind you, as you're probably well aware of my love for RPGs. Though Sony are clearly trying to bring this kind of RPG coverage to the Playstation 4, the Playstation 3 was undoubtedly the system for any RPG fan out there of the previous generation, especially those who enjoy JRPGs. Despite the Xbox 360 scoring big with incredible exclusives such as The Last Remnant and Lost Odyssey (seriously, go play them! CeX should have them by the bucket load. ), there wasn't much else for us fans out there. Though this latest RPG offering isn't exactly perfect, it just goes to show that you can't count the previous generation of consoles out just yet. Developed by Gust and out now on Playstation 3 comes Ar noSurge: Ode to an Unborn Star, a game that, apart from being a mouthful to say, will sadly go below the radar for many gamers out there. 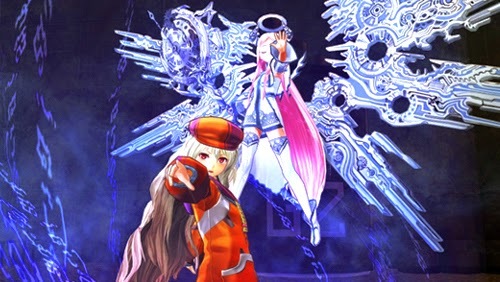 It's a sequel to Ciel nosurge, which was only released in Japan, and it's also a prequel to the Ar tonelico saga. Ar noSurge is set in the fantasy world of Ra Ciela, in which the final safe haven of humanity is a city called Felion. A barrier at the edge of this city holds back the Sharl; mysterious beings who suddenly appeared and started killing humans. In an interesting change up compared to most other games out there, Ar noSurge tells its story from the point of view of two different pairs of characters- Ion and Earthes, and Cas and Delta. Cas and Delta are mercenaries whose mission is to infiltrate a cult of humans that worship the Sharl. Then you have Ion who, alongside a robot she built called Earthes, tries to uncover the truth about the outside world, far beyond the protective walls of Felion. The mixture of different perspectives in its story is both refreshing and successful in terms of world and character building. Though some of the characters here are a little bland, Ar noSurge's story is genuinely compelling, different and worth your time. Navigating the world in Ar noSurge is presented with a mix of both 3D and 2D visuals. Before you can start properly exploring on the ground, the game simply shows you a world map, with various locations you've previously been to showing up as click-able options. Though it all works rather well, the exclusion of large, open cities to fully explore is a shame. Sure you can still talk to a number of in-game characters throughout the cities and even find side-quests, but compared to the on-foot sections it all feels a little empty and dead. Once you've chosen a location the game cuts to a third-person point of view, and lets you freely explore areas at your own pace. Whether you're doing a side-quest, simply hunting for items or doing the main story quest, getting around is easy, fun and, thanks to the fact that you can talk to your team members in case you're stuck, the game always has something interesting to throw your way. At the top of the screen is your enemy encounter gauge, which changes colour when a fight is approaching. This is where Ar noSurge shines, as its combat is huge fun. At the start of each battle you'll need to choose which magic song your partner will use. Throughout most of the battle your partner will be merely preparing to unleash this attack, but it's vital to defeating multiple enemies, and this especially comes in handy if you find yourself almost at the brink of death. Battling in Ar noSurge is turn-based, but compared to other turn-based RPGs, you can attack more than once here. Essentially during a turn you have a limited number of times you can use an attack, and while most gamers equate turn-based battling to being slow and tedious, in Ar noSurge it's fast, frantic and more about having agile fingers than slogging through pages and pages of available attacks. Battles happen in waves, as opposed to a simple one-on-one fighting dynamic, but if you're lucky with your attacks, manage to “break” most of your opponents (which is in-game lingo for basically knocking them out) and manage to unleash your partners magic song, battles can be rather short. It all comes down to a mix of skill and having nimble fingers. Beyond the expected gameplay basics of exploring and battling, there are some interesting extras here. These primarily come in the form of Genometrics, Purification and Synthesis. Genometrics lets you “enter” your partners heart, and essentially ends up playing out like a visual novel, much like Danganronpa 2: Goodbye Despair, a title I recently reviewed. The goal here is to gain your partners trust, thereby unlocking new magic songs for them to use in battle. You can deepen this trust through Purification, which is a lot like Genometrics, but depicts both you and your partner in a hot spring. Through using crystals on each other, you can upgrade each character. Then there's Synthesis which allows you to create new items by combining various items you've found on your travels. All three of these elements to gameplay are the key to upgrading your characters, and ultimately the best way of getting the most out of Ar noSurge. Overall Ar noSurge may not be remembered among the great RPGs of the last generation, but it's still one that's worth your time. Combining lovely visuals alongside some fantastic storytelling and addictive combat, you could do much worse in the RPG department. Ar noSurge: Ode to an Unborn Star is a game you shouldn't let go under your radar and gets a 4/5.